While North Americans traditionally prefer a more lemon-yellow yolk, many countries in Europe and the Far East prefer a deeper orangey yolk. Earlier this spring, Dutch pharmaceutical company DSM unveiled its latest agricultural innovation, which promised to affect the food choices of hundreds of millions of people around the world. The innovation was the culmination of two years of scientific research, although it wasn't a new animal drug or vitamin. It was a colour. Egg yolks come in different shades of yellow around the world, ranging from pale straw to a deep gold, depending on the hen's diet. In general, the more carotenoids – naturally occurring red and orange pigments found in a variety of plants and animals – the hen eats, the darker the yolk. Until DSM's announcement in March, farmers would measure and maintain consistency in colour by using the company's YolkFan – similar to the paint colour fan decks used by interior decorators, with 15 shades of yellow. They also would purchase DSM's animal-feed additive, which includes synthetic carotenoids and allows farmers to create yolks in whichever of the 15 shades they wanted. Like artists with a paint palette, farmers could point to a shade of yellow on the YolkFan, and get the formulation they needed to achieve yolks of that colour. Producers gauge food colour of eggs and salmon by using one of DSMs fan decks, such as the YolkFan and the SalmoFan. Farmers adjust the colour of yolk or salmon by altering an additive in the food they feed their hens and fish. However, in recent years, customers have been asking for even darker shades. While Canadians prefer lemon yellow, many countries, such as Japan, have been moving toward blood orange, and even red. So DSM created a new colour. A #16 egg yolk is even darker than the amber-coloured #15 – more burnt-orange than yellow. The egg is equal in nutrition to a #15 egg, just different in colour to attract certain customers. "The idea of a golden yolk always coming from a healthy hen is being adopted," DSM said in its promotional materials. "As a consequence, we have consumers asking for a deeper shade of colour in their eggs." And it's not just eggs. The idea that we eat with our eyes is a cliché for a reason, and, for decades, food companies have used colour to market foods – especially artificial colours in packaged and processed foods, such as candy. But, as the YolkFan illustrates, many natural foods are manipulated for colour too. DSM also has synthetic carotenoids for salmon and broiler-chicken feed, so that farmers can customize for a specific shade of pink or yellow meat. And customers have shown that they will pay for it. Researchers have calculated exactly how much or less people are willing to pay for each shade, meaning that, for producers, the slightest difference in colour can mean billions of dollars. Numerous studies have shown that colour is one of the more important considerations when people buy certain foods, such as fish – equating colour with quality and freshness. Wild salmon achieves its deep red hue through its diet: plankton, shrimp and other carotenoid-rich food. Farmed salmon, in comparison, is naturally pale, bordering on grey. By adding synthetic carotenoids to the feed, farmers can deepen the colour, making the fish look more like wild salmon. "Our Carophyll pink is a proven way to deliver fish that is attractive to the eye," the DSM's website boasts. In 2004, researchers at the Norwegian University of Life Sciences conducted a study on how much consumers were willing to pay for each of the 15 shades of salmon on DSM's SalmoFan. Their study found the palest two shades "difficult to sell at any price." 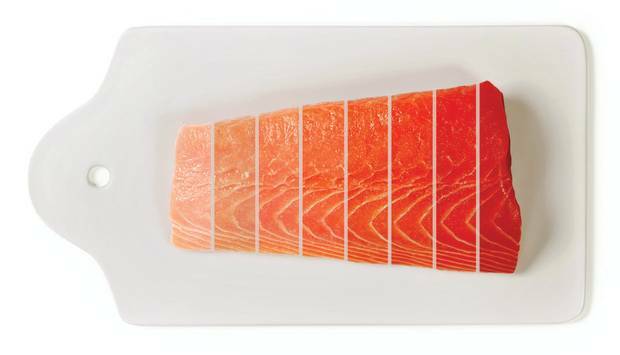 A similar study by the pharmaceutical company Hoffmann-La Roche showed that customers in the United States prefer a "#33" colour on their salmon, and that fish between "#22 and #24" should be less expensive. The Canadian Food Inspection Agency allows for the use of such products, calling the Carophyll colouring agents "approved sources of carotenoids that are commonly used in the poultry and aquaculture industries…" Still, the agency sets limits on the amounts allowed in the feed. Meanwhile, the European Food Safety Authority and U.S. Food and Drug Administration have determined certain DSM carotenoid products to be safe. An app on a smartphone is used with the Nix Sensor, a hand-held device that can read colours of food and non-food products, at the company offices in Hamilton on May19, 2016. And, depending on whom you ask, the colour benefits are either the main purpose, or simply a "byproduct," of the additives. The carotenoids fed to salmon, for example, also have health benefits related to growth and tissue health. A 2014 statement from the B.C. Salmon Farmers Association described the additives as "essential nutrients." It's not just for health effects that the carotenoids have to be measured exactly. The synthetic products are expensive, so measuring the exact outcome – the exact colour – is important too. That's where Matthew Sheridan and his Hamilton-based tech startup Nix Sensor comes into the picture. 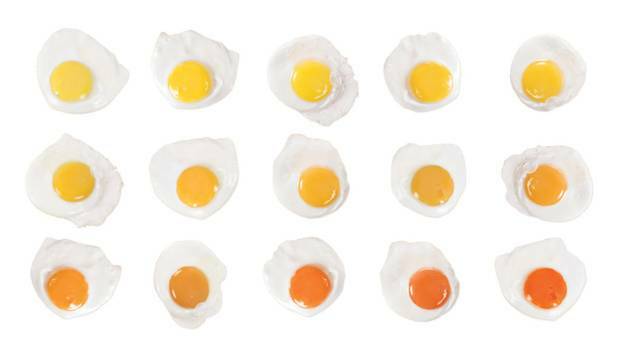 The low-tech YolkFan and SalmoFan methods of measuring colour – holding up the fan decks to the food to match the shade – is cumbersome and subjective. So DSM has recently tapped Mr. Sheridan's company to digitize this process. They are hoping that farmers will use the hand-held Nix Sensor – a device that can be held up to any food, and have a smartphone app calculate the exact colour as well as where it falls on the YolkFan or SalmoFan. "It's like a tape measure for colour," Mr. Sheridan said. Such technology could have a number of implications for the food industry in the future, Nix engineers say. For instance, clerks at grocery stores could use it to figure out exactly when to discount meat – before it has browned noticeably to the human eye, thus increasing the likelihood the food is purchased and does not go to waste. Food producers say that, by using colouring additives, they are just giving customers what they expect. Take oranges, for example. California and Arizona oranges are naturally orange – hence the name. But in Florida, because of weather patterns, oranges are often green, even once they are ripe. So the skin on the fruit is dyed with a colouring agent called "Citrus Red 2" – a restricted substance in Canada, and allowed only in this case because people do not typically consume the peels. Still, experts wonder whether these tactics end up creating expectations, rather than simply matching them. "There could be this big feedback loop going on," said Larry Garber, a marketing professor at Elon University in North Carolina who has conducted studies on customer perceptions of food and colour. With eggs, for example, the colours at the extreme edges of the YolkFan – such as the brand-new #16 – inch increasingly away from any colour found in nature. Producers may say they are just giving people what they want, Prof. Garber said. "They're also teaching people what to want." In the wild, salmon get their distinct pink colour from the naturally occurring astaxanthins in their diet: from plankton, crustaceans and other seafood. Natural astaxanthins are a type of carotenoid, and are sometimes also used as a diet supplement for humans by those hoping to benefit from its antioxidant properties. DSM has created synthetic "nature-identical" astaxanthin, under the brand name Carophyll – a blend of astaxanthins, gelatin and starch. The company's Carophyll pink, designed for use in salmon, has been approved as safe in limited quantities by the European Food Safety Authority. According to a 2014 report, "The use of astaxanthin up to the maximum permitted dietary level for salmon and trout is of no concern for the safety of the consumer." Meanwhile, Health Canada and the Canadian Food Inspection Agency allow the use of DSM colouring agents, calling them an "approved source of carotenoids," but sets limits on how much is allowed. "The Canadian Food Inspection Agency verifies that livestock feeds manufactured and sold in Canada or imported are safe, effective and labelled appropriately," a statement from the agency said. The statement continued to call DSM's products "approved sources of carotenoids that are commonly used in the poultry and aquaculture industries." The U.S. Food and Drug Administration has just reported that DSM's Carophyll red 10%, for broiler chickens, is "generally recognized as safe."